Many of my friends complain that they feel drained, especially when they are having their periods. They say that they lack energy, have trouble sleeping and difficulty concentrating—all symptoms of anemia, which can be caused by an iron deficiency. And although I’m no doctor, I make the same recommendation to everyone: Start taking iron. I’ve been supplementing with iron daily for 15 years now, ever since I was first pregnant. And although menstruation is not exactly an enjoyable experience, I no longer get that totally-drained-can’t-lift-my-head kind of feeling that I had before I started taking it. But there’s one little hitch in my prescription: Up until recently, I was getting my iron through prenatal vitamins. Taking iron as an individual supplement left me—TMI perhaps?—constipated. And although my doctor says there’s nothing really wrong with the practice—the only downside is that prenatals fail as a calcium supplement and give me a little bit more iron and folic acid than I need—those vitamins may be missing the mark. 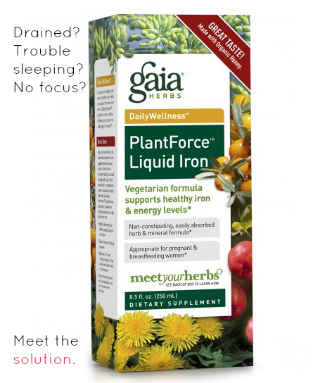 Enter Gaia Herbs PlantForce Liquid Iron. Although I’m no doctor, I make the same recommendation to all my friends who feel run down: Start taking iron. Unlike other supplements, this vegetarian, plant- and mineral-based formula is highly absorbable and non-constipating. The iron is delivered in a base of botanicals like beet root, sea buckthorn and acerola, which facilitate iron absorption and support red blood cell production. Like all Gaia supplements, many of the herbs are sourced from the certified organic Gaia Herbs farm in North Carolina. The company was first to create a program—called “Meet Your Herbs”—that lets consumers use an identification number on each package to track ingredients from seed to shelf. This post was sponsored by Gaia Herbs and meets the standards I’ve established to endorse a brand as “Mommy Greenest Approved.” Click here for more about Editorial Standards. I would love to try this out to improve my health. Thank you for the opportunity and for all the info.